The Endless Plains may seem unremarkable from the distance, with nigh nothing but grass for as far as the eye can see. Yet look into the clouds and you might find great wisdom, as some say you'll see the thoughts of gods. Myosotis, the witty heroine of the Rudowski brothers' (Marek and Marcin) A Grain of Truth, isn't too sure of that, but as she journeys onward to meet with the Wiseman and hear his stories, she encounters the Cloud Catchers and begins to see the grain of truth in the fairytales of old. You are invited to join her journey, embarking on a marvelous adventure filled with fantastic creatures, breathtaking scenery, and, of course, captivating stories. Continuing along the same vein as Bell's Heart, the first in the Big Old Tree that Dreams series, point and click your way through the landscape, solving small puzzles and gathering objects that will aid your passage. Watch your cursor; the leaf turns from green to orange when hovering over interactive areas. Clicking will then provide options that vary according to context, including "go to," "examine," "take," and "talk." To be sure you haven't missed one of these areas, click on the eyeball icon to spot more. Reading and paying attention to the dialogue is necessary; not only should you click on blue-highlighted words to delve deeper in the conversations, each word you click on is collected to gain more stories. At the center of A Grain of Truth is a lyrical and entertaining narrative just as you would expect from this series. Departing from the affability of Bell's Heart, though, A Grain of Truth's puzzles have been ramped up in challenge. You'll explore, gather and make sense of items plus enjoy a mind-boggling game of mahjong or arrange a complex tile puzzle. 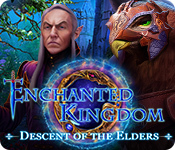 There's little assistance given in game for completing these tasks, calling on you to do the mental footwork in the true spirit of adventuring. That also makes A Grain of Truth longer and more involved than its predecessor. Even so, after completing the map making mini-game, you'll have a smart map to travel by, adding greatly to the ease of navigation; just click where you want to go, provided you've been there already. While you may find yourself stumped and baffled at times, it's well worth pushing through as the quest for answers has never been known to be easy. A Grain of Truth is an overall amazing creation that merges the talent of the storyteller with the art of good gaming. Whether you'll find wisdom or god-like dreams from the experience will depend much on your perspective; either way, the journey is anything but unremarkable. 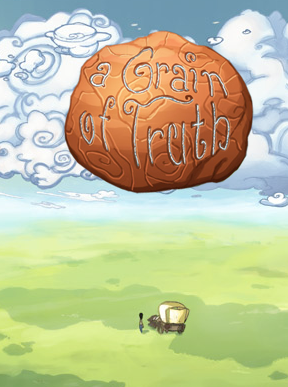 A Grain of Truth Walkthrough now available! Use the mouse to click items in the environment. Select an action from the list after clicking an item to perform that action, such as walk to/pick up/examine. 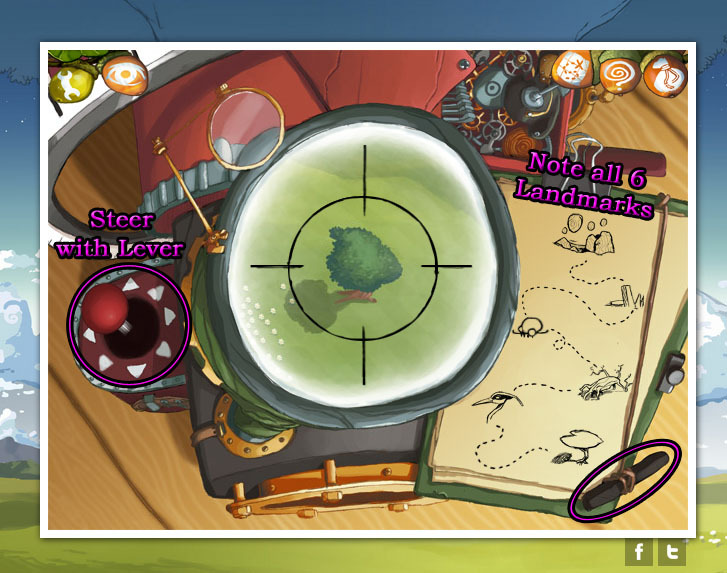 The toolbar at the top contains acorn-shaped buttons with all of the important functions for the game. The yellow acorn with the wrench icon is the Menu button. Click the Menu button to pause the game, turn the music on or off, export a saved game, or quit to the main menu. The acorn with the eye icon is the "Spot" tool. Click the Spot tool to view any active areas in the game that you can click to interact with, indicated by a white circle. The acorn with the map icon is, of course, the Map button. Click the map button to view your current location, indicated by a black spot, and a map of all other previously discovered locations. You can also click a discovered location on the map to travel there automatically. The acorn with the swirl acorn is the Mind button. This is where you can collect tiles representing your Thoughts and organize them into a complete image. The further you progress through the game, the more Thoughts you will collect by completing important actions. The acorn with the bag icon is the Inventory button. Click the Inventory button to view all items you are currently carrying. Family - Located on the Ship's Bow. Talk to the man operating the crane mechanism. Tradition - Located on the Ship's Stern. Talk to the man with the red hair putting clouds in a barrel. Bedding - Located on the Ship's Stern. Talk to the man sitting at the table wearing a hat. Connection - Located at the Cliff. Examine the point where the bottoms of the two walls of the ravine meet. Sleep - Located on the Ship's Bow. Touch the cloud floating above the bow to speak to the man with the net. Price - Located on the Ship's Stern. Talk to the young man carrying a basket of clouds. Business - Located at the Dig Site. Examine the area between the hole in the ground and the yellow canopy. Environment - Located at the Floating Rock Peak. Examine the nest on top of the platform. Cloud Eater - Located at the Ship's Bow. Talk to the woman steering with the cloud eater's reins. Scientific - Located at the Ship's Deck. Talk to the seated woman sorting the clouds. Influence - Located at the Ship's Deck. Talk to the man with the mop scrubbing the deck. Truth - Located at the Hidden Room. Examine the glowing swirl design on the floor. Hidden - Located at the Bedroom. Examine the chest at the lower right corner of the room. Legends - Located at the Wiseman Peak. Examine the Wiseman meditating on the platform. Thought 1/18 is found by picking up the Embroidered Cloth 1/5 on the Ship's Deck. Thought 2/18 is found by taking a close look at the framed picture on the floor of the Captain's Quarters. Thought 3/18 is found by approaching the excavated area at the Dig Site. Thought 4/18 is found by picking up the Embroidered Cloth 2/5 at the Four Large Stones. Thought 5/18 is found by reading the mineralogy book on the table at the Wiseman's Cave. Thought 6/18 is found by reading the label on the hat in the chest at the Bedroom. Thought 7/18 is found by picking up the Embroidered Cloth 3/5 at the Bedroom. Thought 8/18 is found by talking to the Wiseman at Wiseman Peak. Thought 9/18 is found by picking up the Embroidered Cloth 4/5 at the Cliff. Thought 10/18 is found by picking up the Embroidered Cloth 5/5 at the Hidden Room. Thought 11/18 is found by watching the movie from the projector at the Workshop. Thoughts 12-17/18 are found by completing all of the sentences in the captain's story at the Captain's Quarters. Thought 18/18 is found by measuring the stone at the Four Large Stones. Take the Floating Rock 1/4 hovering over the grass. Walk to the tree in the distance to travel to the next location. Note that there is a second floating rock in the air, beyond your reach. Travel towards the tall shadow in the distance to the left to reach the Cloud Eater, then climb up the ladder on its side to reach the Deck of the Cloud Collector's Ship. Talk to the man with the mop scrubbing the deck. Select the blue highlighted section in the sentence to learn the word "Influence". Talk to the large pirate under the crane. Select the blue highlighted section in the sentence to learn the word "Telescope". Talk to the seated woman sorting the clouds. Select the blue highlighted section in the sentence to learn the word "Scientific". Go up the rope ladder to travel to the Ship's Bow. Take the cloud-catching Net sticking straight up at the side of the bow. Use the Net from your inventory on the cloud floating above the bow to gather a bag of Raw Cloud. Touch the cloud to speak with the man with the net. Select the blue highlighted section in the sentence to learn the word "Sleep". Take the piece of Embroidered Cloth 1/5 hanging above the head of the woman steering the creature. You will also receive a new Thought 1/18 in your Mind. Speak with the woman at the reins. 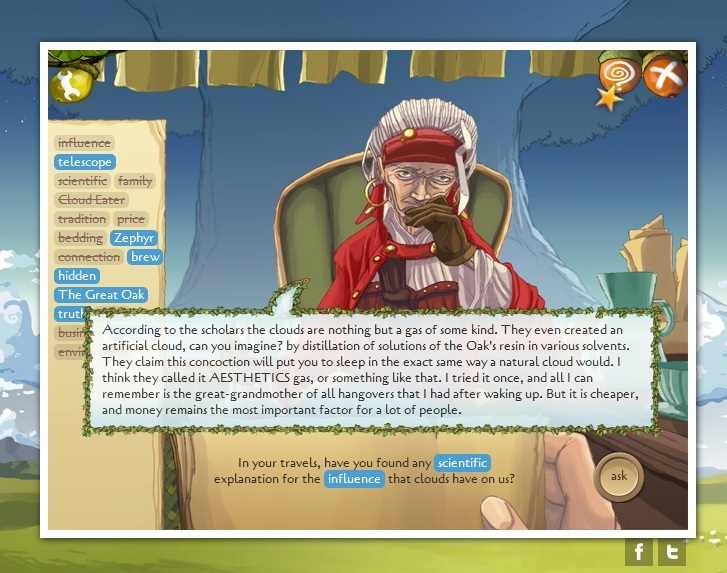 Select the blue highlighted section in the sentence to learn the words "Cloud Eater". Talk to the man operating the crane. Select the blue highlighted section in the sentence to learn the word "Family". Look inside the telescope to get a view of the landscape. Operate the telescope by clicking and dragging the lever in the direction you want to move the scope. There are 6 necessary landmarks you need to spot with the telescope. Each time you find a landmark, use the piece of charcoal attached to the clipboard to jot it down. 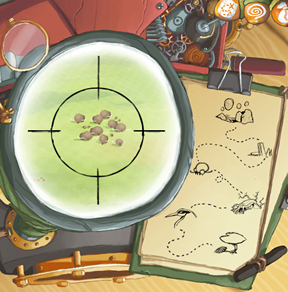 Start by moving the telescope all the way to the lower left corner to find your cart: you'll also earn the achievement "Caught Red Handed". The first important landmark is the area of floating rocks near the upper left corner. Move the telescope right and then down to find the next landmark, the tall rocks. Move the telescope left and down to find the next landmark, a herd of buffalo. Move the telescope right and down to find the next landmark, the dead tree. Move the telescope left and down to find the next landmark, a flock of birds. Move the telescope to the lower right corner to find the final landmark, the lone tree. After you've completed surveying the landscape, go back down to the Ship's Deck. Give the Raw Cloud from your inventory to the woman sorting clouds to start the puzzle. 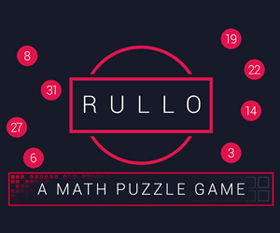 This puzzle is exactly like a game of Mahjong: to solve it, you must match pairs of identical tiles, which will then go into one of the four baskets. 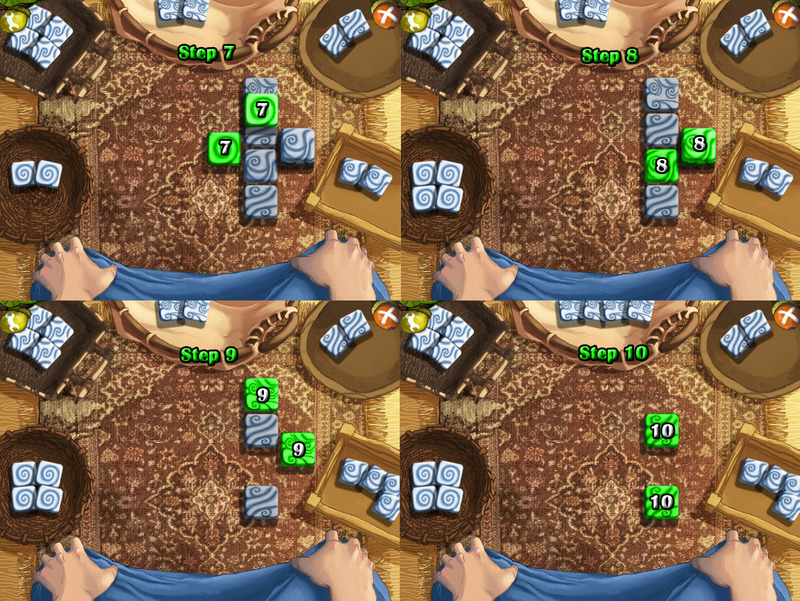 Only free tiles can be removed from the board, meaning it cannot be blocked by other tiles at its sides, nor can it be directly underneath another tile. Click one free tile to select it (it will be highlighted under your cursor) then click another free tile to make a matching pair. After the puzzle is solved, the Raw Cloud in your inventory will become Sorted Cloud. Go down to travel to the Ship's Stern. Talk to the red haired man putting clouds in the barrels. Select the blue highlighted section in the sentence to learn the word "Tradition". Talk to the young man in front of you holding a basket of clouds. Select the blue highlighted section in the sentence to learn the word "Price". Talk to the man at the table wearing a hat. Select the blue highlighted section in the sentence to learn the word "Bedding". Give the man at the table the Sorted Cloud from your inventory to start the puzzle. Rotate the tiles to complete the stitched message. Click a square to rotate it 90 degrees clockwise. Note the connecting lines and swirls of the pattern of the lettering inside the square and the shape of the clouds around the square's border to find each tile's proper position. The Pillow will be added to your inventory after the puzzle is solved. Go up the steps to the Captain's Quarters. Take the Empty Lamp on top of the table. Look closely at the framed image on the floor. You will receive a new Thought 2/18 in your Mind. Leave the ship and go back to the Lone Tree. Use the Net from your inventory to catch the Floating Rock 2/4 hovering in the air. Click the giant floating rocks in the distance to the right to reach the Empty Field. Click your cart in the middle of the field and select "Walk to". If you've completed the telescope puzzle, it will take you to the Floating Stones. Take the small Floating Rock 3/4 hovering near the lower right corner of the area. Click the yellow canopy in the distance to travel to the Dig Site. Push over the pile of sticks leaning against the side of the rock. Take the revealed Hatchet between the sticks. Take the small Floating Rock 4/4 hovering in the upper left area. Examine the area between the excavated area and the yellow canopy. Select the blue highlighted section in the sentence to learn the word "Business". Click the excavated area in the ground beside the giant stone to approach it. You will receive a new Thought 3/18 in your Mind. Take the Stethoscope lying in the dirt. Read the piece of paper lying on the ground, then pick it up to add Torn Page V to your inventory. Go back to the main area of the dig, then continue right to the Four Large Stones. Take the piece of Embroidered Cloth 2/5 lying on the ground near the lower right corner. You will also receive a new Thought 4/18 in your Mind. Go back to the Floating Stones, then click the giant stone split in half to travel to the Clefted Rock. Examine your cart at the end of the path. Select the blue highlighted section in the sentence to learn the word "Zephyr". Click the single floating rock at the bottom of the rock and select "Use Item" to add the four Floating Rocks from your inventory. Climb up the steps of floating rocks to reach the Cliff. Read the piece of paper sitting on the outcrop in the middle of the ravine, then take it to add Torn Page II to your inventory. Examine the touching walls at the bottom of the ravine. Select the blue highlighted section in the sentence to learn the word "Connection". Go through the yellow curtain on the left to enter the Wiseman's Cave. Read the piece of paper over the journal on the ground, then take it to add Torn Page VI to your inventory. Examine the scrolls inside the alcove in the wall. Select the blue highlighted section in the sentence to learn the word "Brew". Take the jar of Oil lying at the bottom of the steps. Combine the Oil with the Empty Lamp in your inventory to complete the Lit Lamp. Look closely at the open mineralogy book on top of the table. You will receive a new Thought 5/18 in your Mind. Go up the stairs to the Bedroom. Read the piece of paper lying on the ground, then pick it up to add the Torn Page IV to your inventory. Examine the chest in the lower right corner of the room. Select the blue highlighted section in the sentence to learn the word "Hidden". Open the chest, then take a closer look. Read the label on the side of the pointed hat. You will receive a new Thought 6/18 in your Mind. Take the piece of Embroidered Cloth 3/5 covering the window. You will also receive a new Thought 7/18 in your Mind. Climb up the rope hanging above the window to reach the Clefted Rock Peak. Use the Hatchet from your inventory on the tangled coil of rope. The rope will fall to the ground and the hatchet will break off the handle, leaving the Axe Blade in your inventory. Cross the rope bridge to travel to the Floating Rock Peak. Examine the nest on the platform. Select the blue highlighted section in the sentence to learn the word "Environment". Now click the nest to take a closer look. Take the Knotted String entwined with the branches in the nest. Examine the trunk of The Great Oak in the distance. Select the blue highlighted section in the sentence to learn the words "The Great Oak". Cross the next rope bridge to travel to the Wiseman Peak. Examine the Wiseman meditating on the platform. Select the blue highlighted section in the sentence to learn the word "Legends". Try to talk to the sleeping Wiseman. You will receive a new Thought 8/18 in your Mind. Go back to the base of the Clefted Rock. Pick up the piece of Rope on the ground that fell from the peak. Combine the Rope with the Axe Blade in your inventory to complete the makeshift Grappling Hook. Climb up to the Cliff. Use the Grappling Hook from your inventory on the red cloth covering the right cave entrance to create a path over the ravine. Take the piece of Embroidered Cloth 4/5 hanging over the edge of the right cliff. You will also receive a new Thought 9/18 in your Mind. Enter the right cave to reach the Workshop. Take the Graduated Cylinder on the floor. Read the piece of paper in the middle of the ground, then pick it up to add Torn Page I to your inventory. Open the small drawer in the work table, then click the drawer to look inside. Take the colored Glass Panes from the opened drawer. Go back to the Bedroom inside the left cave. Use the Graduated Cylinder from your inventory on the small spring at the back of the cave to receive a Cylinder with Water. 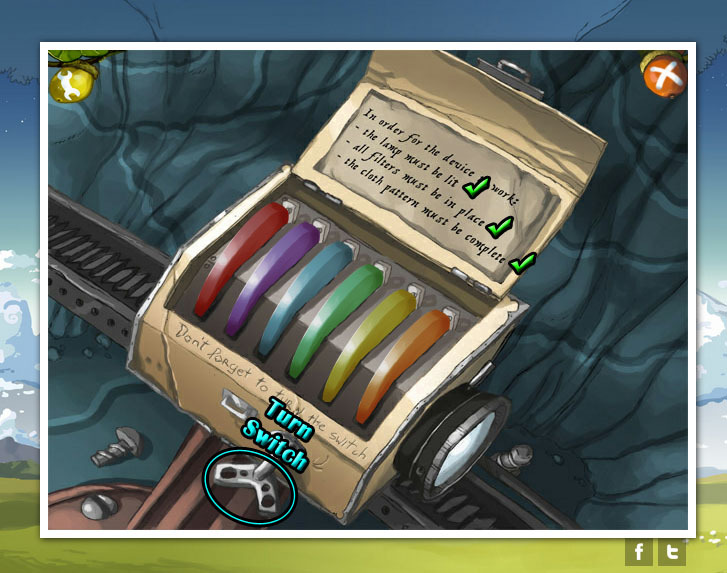 Use the Cylinder with Water from your inventory on the liquid mechanism over the trap door to start the puzzle. 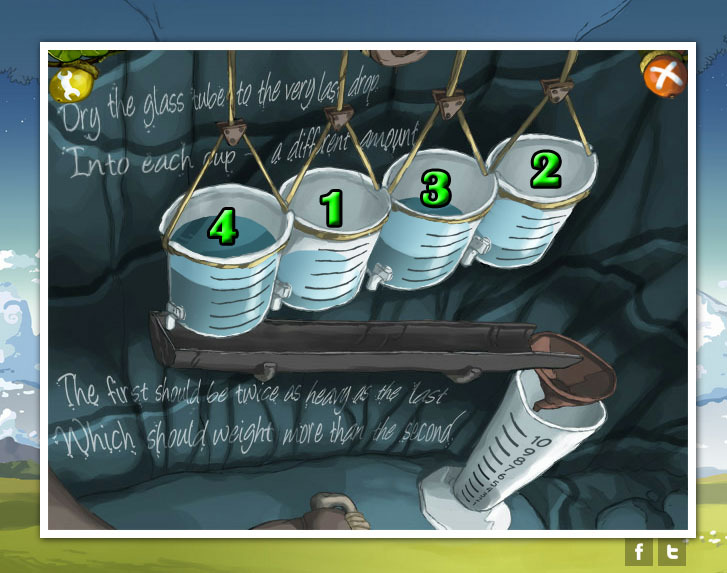 Using the clues written on the wall, correctly divide the 10 parts of water in the graduated cylinder into the four cups hanging from the mechanism. Click a cup to select it, then choose "Pour In" to add water or "Pour Out" to remove water. The message on the wall says: "The first (on the left) should be twice as heavy as the last (on the right) which should weigh more than the second." After the puzzle is solved, go down the revealed stairs into the Hidden Room. Pick up the piece of Embroidered Cloth 5/5 lying on top of the steps. You will also receive a new Thought 10/18 in your Mind. Examine the lit swirl design on the floor. Select the blue highlighted section in the sentence to learn the word "Truth". Replace the broken lantern on the stand of the projector at the lower left corner with the Lit Lantern from your inventory. Add all five Embroidered Cloth triangles from your inventory to the rack at the end of the projector. Use the Glass Panes from your inventory on the filter box. Place the glass panes from your inventory into the slots in the correct order. Use the clues from the Torn Pages in your inventory to find the answer. Note the first letter of every word on each torn page is in bold lettering. Read each bold letter from top to bottom to find the hidden word. Combine the hidden word with the Roman numeral at the bottom of the page to put the words in order. Page 3 is missing, but the last remaining color is Blue. Insert the glass panes from left to right in that order, then flip the switch to start the machine. If the machine doesn't start, check the list at the top of the filter box to make sure you've completed all three steps correctly. If the machine is correctly assembled, the projector will display a movie on the cave wall. You will also receive a new Thought 11/18 in your Mind. Use the Map to travel to the Captain's Quarters. Ask the captain for a story to start the conversation. Use the words you've found throughout your journey to fill in the blanks of the sentences. Click a blank space to select it, then click a word from the list to insert it into the space. For each of the six questions, you will receive a new Thought 17/18 in your Mind. Use the Map to travel to the Four Large Stones. Use the Knotted String from your inventory to measure the second floating stone from the right. You will receive a new Thought 18/18 in your Mind. Now that you've collected all of the thoughts, click the Mind button to start the puzzle. Arrange each tile representing one of the 18 thoughts in the three rings of the circle to complete the image. Click a space in a ring to select it, then choose a tile from the list to place it on the ring. Once the puzzle is solved, use the Map to return to the Hidden Room inside the right cave. Place the Pillow from your inventory on top of the glowing swirl pattern on the ground. Use the Stethoscope from your inventory with the pillow on the ground. Go to the Bedroom inside the left cave. 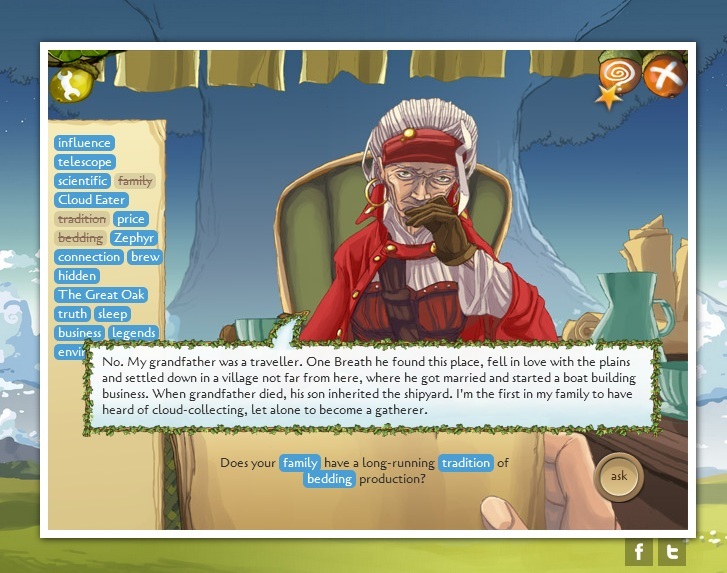 You can also choose to ask the Wiseman a question. Type in a word in the blank space to ask him about a number of topics. Although it isn't necessary to complete the game, you can learn more about the story. Thanks, Swami and coolsonh, for some of the suggestions! If you try to use the Map to travel to the Cloud Eater's Ship, you will find that they are long gone. You can also choose to go back to the Four Large Stones to remeasure the floating stone with the Knotted String. If you choose to reach the end of the game, travel to the Lone Tree. Walk towards the large object in the distance to the left to find Zephyr. Click Zephyr to travel away. Well... ah... that was an interesting game. I'm not sure what to make of that ending. ...I seriously wish there was a way to review the information you'd already learned. Ugh, I'm stuck on the cloud sorting part. Any hints? Trinn is working on the walkthrough and it should be up soon. 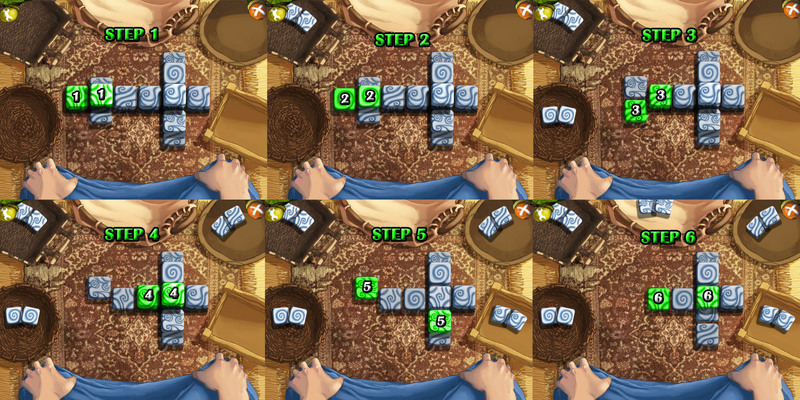 It's played like traditional mahjong in that you can remove tiles from the end of a row by matching pairs. In this case, the tiles are stacked upon each other in such a way that there is only one possible combination... you need to remove each tile in a certain order or you'll get stuck. Keep track of your steps so you know what to change. In that way, it's a bit like completing a Grow puzzle! Did anyone get some sensible information out of him? I got all of the cloths, the lantern, and the lenses, and I put them all in the machine. But when I turn the key, it says something's wrong. (The lenses are, in order: Red, Purple, Blue, Green, Yellow, Orange). I AM missing the page of the journal that'll say blue. I'm also on the Captain's third story. I don't know if I just missed a word somewhere, or if I'll just find it later. Know if I should be farther with her? The cloth pattern must be complete (All 5 Embroidered Cloth pieces must be in the rack at the end of the projector). If you've got all of those steps completed, the machine should start when you turn the switch. I'm stuck on the second story? Fill the glasses with water to open the trap door. The complete sentence reads: How did you find the "Connection" between clouds and "Sleep"? If you have a look at the graduated cylinder, you'll see that it's filled with water up to line 10. That means you need to fill the four hanging cups of water with the correct amounts that also add up to 10. The amount in the first cup (the one on the left) is twice the amount in the last cup (on the right). The amount in the last cup is greater than the amount in the second cup. Click each cup and select "Pour In" to fill the cups to the amounts mentioned above. than I'm missing the second word, any pointers? I'm sure I've examined everything that I possible can examine for the better part of an hour. Go to the Ship's Bow of the cloud collector's ship. Touch the cloud that's floating above the bow to speak with the man holding the net. Select the blue highlighted section in the sentence to learn the word "Sleep". I'll also add this information to the walkthrough shortly. thank you very much Trinn. Whats the last word for the 3rd story, Heard someone above got the word business but can't find it? by examining the area under the canopy, where the wiseman's tools and the glowing blue rock is. You have to examine from back a bit, though. Augh, I have one bit of the mind puzzle thing not found, and I'm betting finishing it is what let you wake up the wiseman. Neat, I was wondering when the storyline would continue. They supply something you should keep in mind. It's the rock next to the one on the right that helps. The others don't help. As it mentions at the start of the walkthrough, some of the screenshots are not currently available, but will be updated shortly! For now, read the "Necessary Words Locations" in the walkthrough to learn the correct word and its source for each of the captain's sentences. Edit: Screenshots are uploaded and should be working now! If you speak to the Wiseman when he's in the Bedroom and read Torn Page I (found on the floor of the Workshop) you'll find that the floating stones serve a very important purpose. The Wiseman measures their distance from the ground, and how far they've lowered indicaties how long he has been caught in the dreamlike state while communicating with The Great Oak. The page also contains a drawing of the correct floating rock. You can identify it by the swirl designs shown on the paper with an arrow pointing to the bottom of the rock. If you inspect that indicated area of the rock in the game, you'll see that the patterns are identical. Also, kudos to the game creator for including the eyeball icon to eliminate any pixel hunts. The only puzzles that gave me fits were the cloud-sorting one (I had to resort to the walkthrough for that one) and learning all the words for the captain's story (I didn't even realize that I was missing some words at first). What a fantastic game! I remember playing the first one ages ago, and being intrigued at the time. I'm so glad that the second game was so well done! Everything from the art, to the story, to the music, to the difficulty- it was all just right. I really like the way they've created an entire world with it's own lore and terminology. Bravo guys, keep up the good work! I put the lit lamp in place, I have all of the cloth triangles in the rack, and the filters were all in the right order. Just now, I removed and replaced the orange one, and it started to work. Looks like that fixed it. *shrug* Thanks for confirming that everything was right though! Remeasure the floating rock to see how much time has passed. Gorgeous. I'm not finished playing yet, but I just wanted to say how astounded I am by the sheer depth of this game. What really made me fall in love were the statements that appear when the player makes a mistake - where a simple "I can't use this here" or "Items can't be combined" would suffice, Myosotis patiently explains that the pages torn from a book can't be combined with the spring because they are too brittle to make a paper boat, and when you try to use the net to cross the cleft in the rock, she admonishes you for frightening the evil cave fish who have a crippling fear of nets. I could play this game for hours. Do you mean for the telescope minigame? In that case, dragging should work... you just need to click and hold the lever, then move it up/down/left/right to direct the scope. How long would a "Blossom" be? I took it to mean one year, marked by the passage of spring when flowers "blossom". Anyway, this game had been a wonderful, immersive, (insert all synonyms of amazing and beautiful here) experience. The puzzles were logical and not too difficult. I especially liked how they fit the in-universe's logic (e.g: mahjong for cloud-sorting and linking threads for cloud-weaving). The amount of detail invested in world-building is also breath-taking. I wanted to keep exploring and learning more about this world and its mythology. I may also be slightly in love with the idea of catching clouds now. This is Marek Rudowski, one of the creators of the game. First of all let me thank You for the flattering review, detailed walkthrough and all Your comments. They mean very much to us. They give us strength and encourage us for futher work. We hope that You will enjoy playing our future games as much as we enjoy creating them for You. According to Mateusz Skutnik, this game is independent of Pastel Games and isn't part of the Trade of Stories franchise but is part of the same universe. So the name should just be listed as A Grain of Truth. This is Marek Rudowski one more time. I just want to explain the subject with the Trader of Stories franchise. As it states at the bottom of the starting screen of the Bell's Heart game (made in cooperation with Pastel Games): "The Trader of Stories" is a part of the "Big Old Tree that Dreams" which is the property of Marek Rudowski. I have first used the term "the Trader of Stories" when working on my demo (in 2009). This expression is both the title of the demo and the nickname of Myosotis. In Bell's Heart it was use as a subtitle to emphasize the connection between the two games. With "A Grian of Truth" we wanted to start a larger story, in which Myosotis plays only a small part. In the next chapters the main characters will change from episode to episode. Therefore we have left it without the subtitle "The Trader of Stories". Not to rain on the parade, but... it is terribly disappointing to have a narrative-heavy game with typos in it. Spell-check grade typos, so I can't really cut slack for native languages. Thanks, Marek, for explaining your reasoning behind leaving off the subtitle, and I'm afraid that lead to the confusion because A Grain of Truth also shares Myosotis (aka Trader of Stories) as the central character. It would be helpful, for purposes of cataloging, to identify the world in which these games exist and use that as a subtitle for future games, which would be something we could add to the previous games as well. Perhaps I'll go back and identify them all as part of the "Big Old Tree that Dreams" series of games. Uh oh. I hate to be the bearer of bad news again, especially for such a well-composed game. The game won't exit from the completed Mind puzzle. At first I thought it was because the [x] was over the Mind button, but the window just won't close. The puzzle is completed and I've gotten everything out of it. I've reloaded in every way I know how. The game is just stuck there. Well, if it were my browser, how did I get to this point in the game? I played nearly the whole game without major problems. I can click on the finished puzzle and read the text. I can open the settings menu, and all those buttons work. 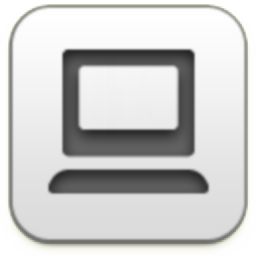 Even the [x] itself is responsive, it just doesn't actually do anything. Like I said, I've tried everything. This smells like a serious glitch. I'm really, really disappointed to have come so far in such a gorgeous work. It's like Mona Lisa missing her smile. There is a Traders of Stories blog where the developers have updated with their progress. This game is awesome! Also, I didn't encounter any bugs or typos, just a magnificent fantasy univers that I'll think about for weeks! This played well on Linux/Firefox for me except that the sound kept cutting off a few seconds into each scene. Otherwise very enjoyable. The story is building up nicely too. Broken, in Chrome? How do I dismiss the inventory? The image within the frame grays out slightly proceeding from left to right, but stops before reaching the edge, and there's no "X" acorn to close it back down. Every time I bring it up or try "use item" I have to reload the game because the control is either missing or I'm being hugely dense. The inventory also appears to be empty even though I took the first floating stone and patterned cloth (with an animated star confirming that the were indeed picked up). Plus the cursor keeps disappearing/reverting to a regular cursor, which makes the color change less than useful. Not to mention a slight lag on the controls that leads me to question whether I successfully clicked *every single thing ever,* so I click again and then have to sit through the dialogues fluttering as they load repeatedly because of my impatience. Either I'm broken or the controls are. Okay, works in Firefox, so it's not me. Chrome issues still game-breaking. I'm baffled by the problems Dulcibella described... I just finished playing through the game in Chrome, and didn't encounter a single one of the bugs she mentioned. The Trader of Stories: Bell's Heart was a fantastic game, but The Big Old Tree That Dreams: A Grain of Truth far surpasses it! It's one of the most immersive games I've ever played, point-and-click or otherwise, and I was continually amazed by how perfectly the mini-games were integrated into the story. I think Marek and Marcin R. have even topped the Drawn series for immersiveness and natural-to-storyline puzzles, which I wasn't expecting to see another game accomplish so soon. 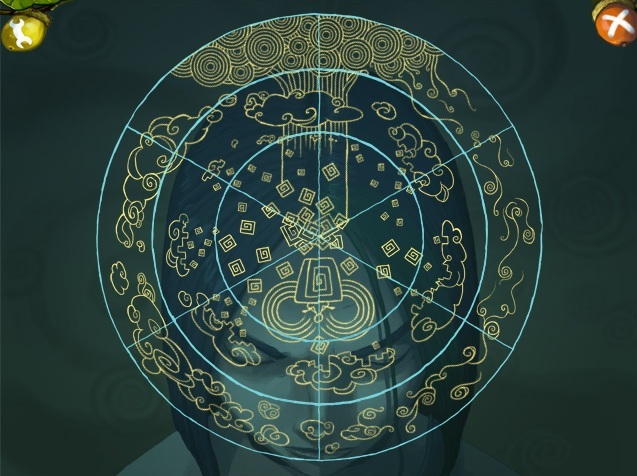 As is appropriate for a game about collecting and retelling stories, the story told within A Grain of Truth is fascinating and fantastic (in the sense of a fantasy story); engaging and engrossing; and it both satisfies and leaves the player wanting more. It's also a story that feels as though a game was the best possible medium for telling it -- I think only an animated film could have come close, and still wouldn't have been the ideal vehicle for delivering the story to its audience. Which brings me to: The art in this game was both gorgeous, and also strikingly distinctive, different from the art style of any other game I've played... and thus perfectly suited to the unique setting of ForestBed. The variety of vantages/viewpoints in different screens was a refreshing departure from straightforward first-person views and isometric interface designs typical of many point-and-click games. not truly floating, but rather falling extremely slowly. Few game creators imbue their created worlds with this level of mytho-historic background! Extra kudos to Marek for his attention to these sorts of details. Finally, I just want to address the complaint another commenter made about typos, misspellings and other grammatical issues. I am one of those people who will nitpick every last little writing error (mainly because my brain does it to me, far more often than I complain to anyone else about such errors) but, despite my Grammar Jackboots, I found the number and types of errors in the text portions of this game quite tolerable. Spellcheck is not perfect; it frequently gives both false positives and false negatives, and it can be especially difficult for a non-native English speaker to tell when their spellchecker is wrong. Could the text portions of the game have been improved by having a native English speaker follow up Maria Barc�'s (generally excellent) translation to catch some of those errors? Sure. But this game is the work of a small team, not a big software company... and remember that the game is free, so there was no profit fund available for them to hire freelancers out of. Maybe for their next game, they'll invite a fan with the proper background (I qualify, actually, aside from not knowing any Polish, and would be willing to work with Marek & Martin on a future project, depending on my availability at that point, but I digress) who's willing and able to donate their time to catch and correct all those little errors. They're just that, though: minor errors. None of them had to be puzzled out in order to figure out what to do next or what a character was supposed to be saying. Most of them didn't even break the immersiveness of the unfolding story (at least not for me). Especially when considered against the superlative achievements of A Grain of Truth in every other element of game design, the occasional textual mistakes are even more negligible by comparison. 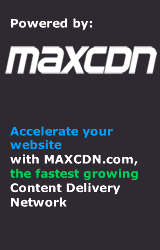 I just upgraded my Firefox browser, and this game no longer works. It says I require "pointer elements for HTML", or something like that. I adore this series. the story and the graphics are beautiful, like something out of a painting. can't wait for the next one! well that's annoying. I'm using Google Chrome version 19.whatever, and it says that my browser doesn't meet the requirements of the game, even though it's listed. I'm using Windows and with the latest versions of Firefox (13.0.1) and Chrome (19.0.1084.56), it works perfectly. When the tiles are in the correct order, you'll get the pillow added to your inventory. Please double check that your tiles are an exact match to the image in our walkthrough...there could be a subtle difference you haven't noticed yet. I look forward to seeing the next game in the series. Okay, after several months I finally got to finish the game. In the final puzzle section there is no map button at all. The X doesn't work. So you just... click where the button isn't. Yes. An invisible button. Two steps from the end(?)game. I did update flash a few times since my first attempts but this was still hours of brain-break and staring at a finished puzzle. I'd be more frustrated if the ending(?) weren't so fascinating. Made it thru game to the old man in his bedroom. Asked him some questions that he responded to. But i dont know wtf I'm to do at this point. ARGGGGGGG! Sounds like you're near the end of the game since reaching the wise man and talking to him was Myosotis' objective all along. Now, you can talk to the wise man as much as you'd like (and peek at the walkthrough for ideas on what to ask). Walk back to the Lone Tree. 1. Taken the fabric from the bow of the ship. 2. Examined the framed picture/quote in the stern of the ship. 3. Examined/approached the strange glowing spiral in the digsite. ...but I only have two thoughts unlocked so far? I thought each of those was supposed to give me a thought. Could someone explain the terms Breath and Blossom to me please..? There are other terms too.. I know they're measurements of time, but.. I've kind of got them muddled up, I think. I'm stuck. I don't have the Thought 18 and nothing works. I've measured the correct rock, then I've measured all the rocks, then I've tried a couple times more. She just says "OK. I can measure the height on which the stone floats but what should I make out of it?" and nothing happens. I've even restarted the game and tried it all again, no result. I really liked both of these games! I'm curious if there is going to be another part because the 2nd ended with a cliff hanger... is there another expected to come out? its 2014, and I haven't seen another from them... anyone know?